Hey everyone, Daft Gorilla here. First off has anyone noticed the date?? 10/11/12 oooh spooky… But not really :P So I am back today with a screen shot of my sporadic trades I made through out the day. I am in the tedious process of training a couple month old puppy (or trying to anyways) and as a result I have made some trades at some odd times. I do have experience trading all market sessions but I would like to warn any potential new traders out there: EACH MARKET SESSION IS A DIFFERENT ANIMAL ENTIRELY!! Demo/Watch the session a good few times before you jump into it. Some traders might be successful trading only during the New York session while others find the Asian to be much more profitable. Time for a quick post-trade analysis! (I live in the EST time zone for those of you wishing to go back and check your charts to see where I placed my trades AND I WILL BE SPEAKING REGARDING 5 MINUTE CANDLES UNLESS OTHERWISE NOTED) A key trade and also the first of the day (aud/usd @ 21:09) was a nice quick 400 dollar trade in my opinion. After a pretty fast hard upward movement on the aud/usd, it lost a bit of momentum and started to retrace back down to a few key areas that gave me confirmation to get in. The first key area for me was the fact it came down and kissed the 61.8 Fib Retracement level. The second thing I noticed is how the 14 period exponential moving average seemed to be holding price up, and maintaining the uptrend even though we saw a temporary retracement. With four bearish candles in a row after an otherwise extremely bullish trend, I felt I was about to see a nice pop. So I took my entry and collected my reward. Now for the set of trades that will most likely be seen as very controversial… I placed three consecutive puts on the eur/usd starting at 22:59 and losing twice before I hit my winning trade placed at 23:09. Against all textbook rules, I felt as though in such ranging market the eur/usd could not continue to maintain a continuous set of bullish candles for very long and would be very soon closing lower than a previous candle. So I implemented a “double or nothing” binary betting strategy and picked my entry and began chasing waiting for what I predicted to come. 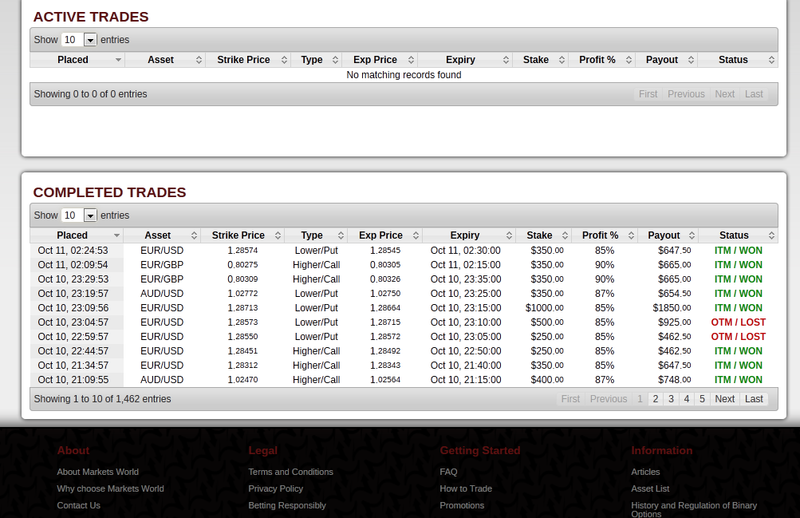 I lost twice before I hit it but I still profited over both losses in a single trade. Today I was able to just almost reach 1500$ in profits for the day and ended up with 8 wins and 2 losses. Not a bad day if you ask me :) I look forward to questions and comments, and I will be back soon!